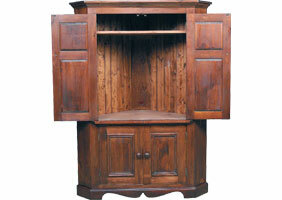 The Corner TV Armoire has four doors, two upper and two lower, and fits into a corner. The upper doors open to one fixed shelf that can hold components, the shelf is located above the TV. The lower doors open to one shelf located in the center. The corner depth required for this cabinet is 32", this is a measurement from the inside of a corner out along a wall. Fits a TV that is 32" wide. 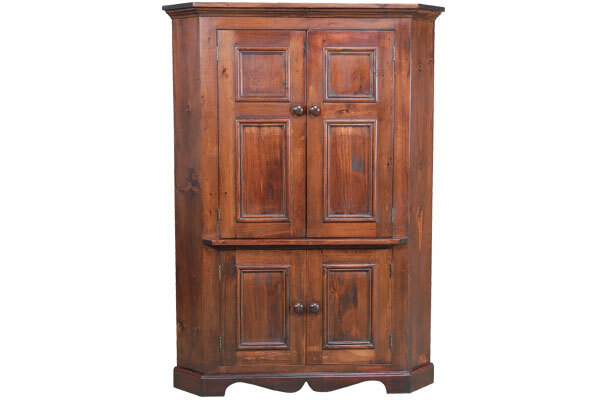 Add functionality and French Country style to a corner in the living room or bedroom with the Corner TV Armoire. The corner media cabinet with doors tucks snuggly into a corner providing room for up to a 32" flat screen tv and other media components. 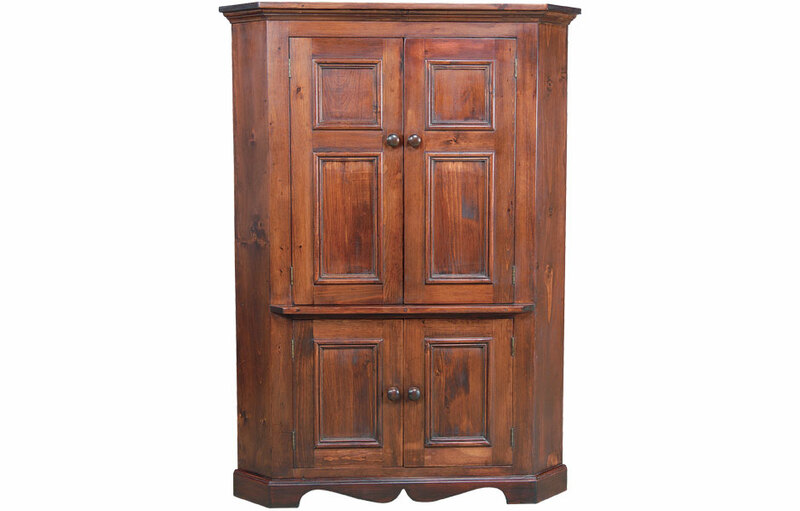 The Corner TV Armoire is made of solid wood, including the tongue and groove backing. The two upper doors open up to a corner televison storage area with an upper shelf above for your cable box, DVD, Roku or Apple TV. The upper cabinet has room for a 32" wide television. The television sits at a comfortable viewing height of 30" off the floor. The upper cabinet	doors	have	(2)	decorative bevel panels adding French Country style to the TV unit. In the lower cabinet with doors has a centered storage shelf for additional media components, game consoles, and storage. The back has holes drilled to pass cords between the upper and lower cabinet. The back also has cord holes drilled. The corner media unit has a corner depth of 37". Corner depth is measured from the corner along the side wall. For proper fit, ensure that there isn't any obstructions 37" from the corner. The	front	of the cabinet has a width of 38". 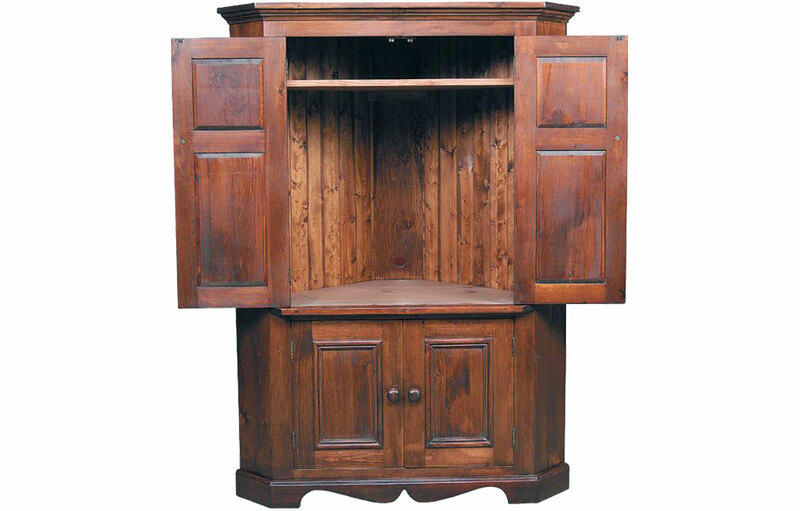 The Corner TV Armoire has crown molding, and a scalloped base molding. 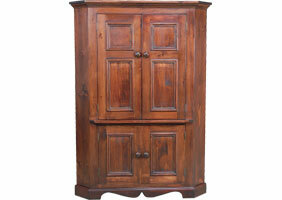 The media armoire can be painted in any of our paints or stain finishes. The interior and top of the piece are stained natural, unless otherwise indicated.